Chipotle Chicken Chili with Flaming Tequila-Pepper Salsa and Avocado Ranch Dressing + Rachael Ray Signed Cookbook Giveaway! I’ve mentioned before that my first cookbook was a Rachael Ray cookbook and I have a soft spot for her because of it. She was the first cook that made things feel accessible enough for me to try them out myself. I bought a few of her cookbooks early on but I’d since abandoned them. Except for a few pages in t he middle, they didn’t have any pictures and I came to realize that I’m much more likely to cook something if I know how it’s supposed to look finished. A few weeks ago, Rachael was at my local bookstore signing copies of her newest cookbook, Rachael Ray’s Look + Cook. I decided the opportunity to meet her was worth the price of another cookbook for the shelf. Rachael was really nice and I was pleasantly surprised to see a good chunk of the book had color pictures. Mark picked this recipe out of the book to try and I was a little hesitant about it for a weeknight dinner because it seemed like it had so many elements. Everything came together quickly, though, and it produced a very nice meal with less effort than I anticipated. Definitely a keeper. Place a large heavy-bottomed pot over medium-high heat with 2 tablespoons of the olive oil. Add the bacon to the pan and brown, about 3-4 minutes. Add the chicken to the pot and brown, 5-6 minutes, stirring occasionally to break up the lumps. Add the pureed chipotle, cumin, coriander and smoked paprika, then stir for 1 minute. Add the onion and garlic to the pot and cook until tender, 5 minutes more. Add the tomato paste and chicken stock and some salt and pepper to the pot and bring the liquids up to a bubble. Reduce the heat to a simmer. While the chili is simmering, place a medium size skillet over medium-high heat with the remaining 2 tablespoons of olive oil. Add the bell peppers, red onion and jalapeños to the skillet and cook until tender, 4-5 minutes. Remove the skillet from the heat and add the tequila. Return the skillet to the heat and flame the tequila to burn off most of the alcohol. Add the lime juice, cilantro and some salt to the salsa. To a food processor bowl add the avocado, chives, lemon juice and buttermilk. Process until smooth and then season with salt and pepper. 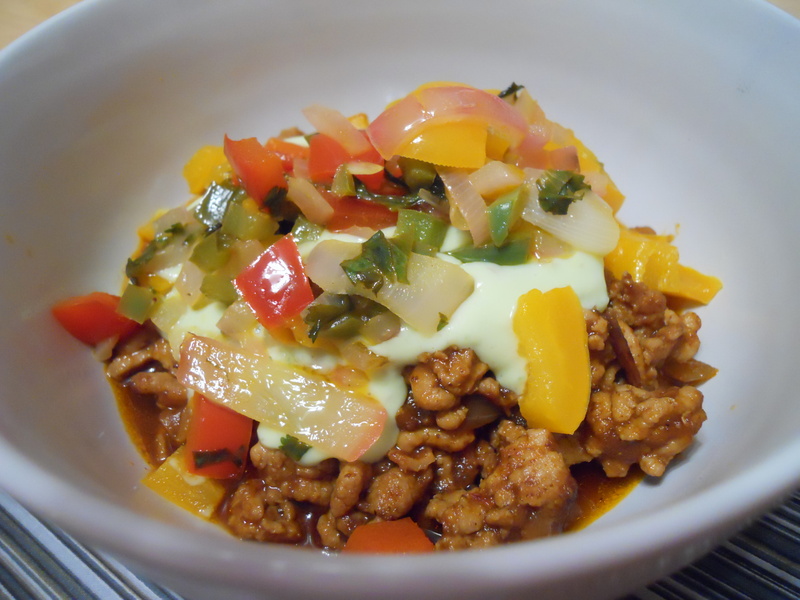 Serve up the chili with some of the tequila-pepper salsa and avocado ranch dressing. Garnish with tortilla chips. While I was at the book signing, I got another copy of Rachael Ray’s Look + Cook signed for a lucky reader. All you have to do to enter is leave a comment letting me know who or what inspired you to cook. For an additional entry, subscribe via email (in the right-hand column) and leave me a seperate comment letting me know. Already an email subscriber? Leave me a seperate comment letting me know that too and you’ll get your second entry. Comments can be made until midnight EST on December 10, 2010. I’ll announce a winner December 11. « Michael Chiarello Cookbook Giveaway Winner! I learned the basics from my mom growing up & cooked a little throughout college from necessity. Once I got married, I really started learning how and loving to cook! I love making a good meal for us and sharing with family & friends! This looks yummy, I will have to try it. I got into cook because well, I got married. Once I found out that I can cook, I decided to do it more. A lot of recipes come from the Food Network and other bloggers. The chipotle chicken chili sounds wonderful. I enjoy making Rachael’s recipes. I have always loved to cook. I think I got into it because so many of my close relatives also love to cook.. my Mom, Dad, both Grandmas and several Aunts and an Uncle. It just came natural I guess. Thanks for the opportunity to win Look and Cook. I took a peak at it recently at Wal-Mart but my budget wouldn’t allow it at this time. How neat it would be to win. Oooo! I am definitely going to try this chipotle chicken chili recipe. Let’s see my inspiration for cooking is simply my love of food! I think there is amazing food out there. Getting a chance to re-create dishes or reinvent them daily is a pure pleasure. I just subscribed to your newsletter via email. before I got married, my then-fiance was teasing me a bit about my lack of kitchen skills. I wanted to show him that I could make something, so I started searching online for an easy recipe. I was shocked to find so many cooking and baking blogs that make it seem easy and fun. so I tried a recipe and it worked perfectly and my whole family oohed and aahed over it, so I kept going. Everything you make looks so yummy! My mom is my cooking inspiration. I didn’t appreciate it enough growing up, but she always managed to cook meals for 6-8 people every day, that everyone enjoyed. There was always a variation- and most importantly- everything always seemed to get done at exactly the same time! My mom inspired me from an early age to cook, but a few Rachael Ray books were the first couple cookbooks I got when I was out on my own.